Originally I wrote much of this in a very long article about Unum’s involvement in the government’s Work, Health and disability Green Paper, earlier this year. Sometimes, though, some points get lost in the volume of other issues raised, so I thought I would make sure these particular issues have more visibility in this shorter article. There is plenty of evidence that indicates government policy is not founded on empirical evidence, but rather, it is ideologically framed, and often founded on deceitful contrivance. A Department for Work and Pensions research document published back in 2011 – Routes onto Employment and Support Allowance – said that if people believed that work was good for them, they were less likely to claim or stay on disability benefits. So a political decision was made that people should be “encouraged” to believe that work was “good” for their health. There is no empirical basis for the belief, and the purpose of encouraging it is simply to cut the numbers of disabled people claiming Employment and Support Allowance (ESA) by “helping” them into work. A number of Government programmes assess and support those with mental health difficulties to work, but it is internationally recognised that the evidence base for successful interventions is limited. The government have gone on to declare with authoritarian flourish that they now want to reinforce their proposal that “work is a health outcome.” Last year, a report by the Mental Health Task Force and chaired by Mind’s Paul Farmer, recommended that employment should be recognised as a “health outcome”. I’m just wondering how people with, say, personality disorders, or psychosis are suddenly going to overcome the nature of their condition and successfully hold down a job for a minimum of six months. The idea of the state persuading medical professionals to “sing from the same [political] hymn sheet”, by promoting work outcomes in health care settings is more than a little Orwellian. Gaslighting narrative has become common political practice. Sick and disabled people who have their lifeline support cut are being “supported” into work. People who are too ill to work are said to have “fallen out of employment”and “parked on benefits”, as if these are not rational decisions made by competent people who know that they cannot work any longer, and that quite often, to continue doing so would place themselves and/or others at risk. Benefits are paid for by people when they work as a social security, for in case they encounter difficult times. People tend to claim what they need, rather than becoming “parked” on benefits. The idea that work will somehow set us free from illness is a very dangerous one. Conservative narratives are comprised of glib, intentionally misleading, disdainful and patronising language from an utterly ruthless elite running the country into the ground, leaving such an unkind and uncaring society for the next generation, with nothing left of the “from the cradle to the grave” provision that previous generations have relied on. Sick notes have been renamed “fit notes” and disability benefit is now “employment and support allowance”, emphasising the linguistic behaviourism and ultimate priorities of a “small state” neoliberal government. Work is the only route out of poverty. If you can’t work, that’s just too bad. Some people’s work is undoubtedly a source of wellbeing and provides a sense of purpose and security. That is not the same thing as being “good for health”. Rather than make a link between manual work, lack of reasonable adjustments in the work place and the impact this may have on longer term ill-health, the government chose instead to promote the cost-cutting and unverified, irrational belief that work is a “health” outcome. Furthermore, the research does conclude that health status itself is the greatest determinant in whether or not people return to work. That means that those not in work are not recovered and have longer term health problems that tend not to get better. The fact that government policy papers lack coherence, consistent logic and rationale is very troubling, because it indicates plainly that government policy is being driven by assumption, prejudice and ideology. The government mantra “making work pay” was nothing to do with improving falling or stagnating wages and job insecurity, or poor working conditions. It was all about making sure that the conditions attached to social security eligibility are so punitive and wretched that only those people who are absolutely desperate will put themselves through the harshly punitive and stigmatising claim and conditionality process. “Making work pay” is really all about making social security appear unsustainable and untenable. It’s about a governments’ priorities and choices expressed in Orwellian soundbites. It’s about a “business friendly” government that will always make sure your employer makes a hefty profit at your expense. It’s about the introduction of ordeals in order to deter people from claiming the welfare support that they paid for, for when they need it. It’s ultimately about dismantling the gains of our post-war settlement. It’s about the neoliberal small state and Conservative dogma. As neoliberals, the Conservatives see the state as a means to reshape social institutions and social relationships based on the model of a competitive market place. This requires a highly invasive power and mechanisms of persuasion, manifested in an authoritarian turn. Public interests are conflated with narrow economic outcomes. Public behaviours are politically micromanaged. Social groups that don’t conform to ideologically defined economic outcomes are politically stigmatised and outgrouped. This is the dangerous, irrational, savage and neoliberal mindset behind the cuts to disability support. Medication, rest, release from duties, sympathetic understanding – remedies to illness – are being redefined as “perverse incentives” for “sickness behaviours”, yet the symptoms of an illness necessarily precede the prescription of medication, the Orwellian (and political rather than medical) “fit note” and exemption from work duties. Notions of “rehabilitation” and medicine are being redefined as behaviour modification: here it is proposed that operant conditioning in the form of negative reinforcement, which the authors seem to have confused with punishment, will “cure” ill health. Imagine trying to sell the bordering-on-psychopathic idea that medicine provides perverse incentives which encourage “sickness behaviours” in patients to doctors, preventing them from recovering in a timely manner so they can promptly return to work. I’m sure that oncologists everywhere will be relieved to see that their cancer patients simply needed to be told to pull themselves together, and that what they need is a stiff talking to, instead of the soft options entailing mollycoddling, chemotherapy and surgery. This is the same kind of thinking that lies behind the broader welfare sanctions, which are state punishments entailing the cruel removal of lifeline income for “non-compliance” in narrowly and rigidly defined “job seeking behaviours.” Sanctions are also described as a “behavioural incentive” to “help” and “encourage”people into work. People who are ill, it is proposed, should be sanctioned, too, which would entail having their lifeline basic health care and money for meeting their basic needs removed. The darker meaning of David Cameron’s comments about “ending a culture of entitlement” back in 2010 has become clearer. He wasn’t only talking about perceived attitudes and referencing erroneous, unverified and unfounded notions of “welfare dependency”: his party’s aim was and still is about reducing public expectations of a supportive and rights-based relationship with the publicly funded state – one that has evolved from the post-war settlement to ensure that everyone in the UK can meet their basic human needs. It’s no coincidence that we have witnessed the savage reduction of social security and rationing within our national health care systems since 2010. This government is serious threat to all of those institutions and public services that contribute to make us a civilised society. In 2017, I should not have to say that poor and ill people cannot be simply punished, bullied, harassed (or “nudged”) out of being poor or ill. As politically inconvenient as poverty and disability are, no amount of authoritarian state gaslighting, abuse, bullying and harassment will “cure” those of us afflicted with either. Behavioural medicine was significantly influenced by American sociologist Talcott Parsons’ The Social System,1951, and his work regarding the sick role, which he analysed in a framework of citizen’s roles, social obligations, reciprocities and behaviours within a wider capitalist society, with an analysis of rights and obligations during sick leave. Behavioural medicine more generally arose from a view of illness and sick role behaviours as characteristics of individuals, and these concepts were imported from Functionalist sociological and sociopsychological theories. However, perhaps it should be pointed out that there is a distinction between the academic social science disciplines, which include competing and critical perspectives of conflict and power, for example, and the recent technocratic “behavioural insights” approach to public policy, which is a monologue that doesn’t recognise the need for citizens’ democratic consent to behavioural change, nor does it recognise controversy or include critical analysis. It serves as prop for neoliberalism, conflating citizen’s needs and interests with narrow, politically defined economic outcomes. We have a government that has regularly misused concepts from psychology and sociology, distorting them to fit a distinct framework of ideology, and justification narratives for draconian policies. Parsons’ work has generally been defined as sociological functionalism, and functionalism tends to embody very conservative ideas. From this perspective, sick people are not productive members of society; therefore this deviation from the norm must be policed. This, according to Parsons, is the role of the medical profession. More recently we have witnessed the rapid extension of this role to include extensive State policing of sick and disabled people. 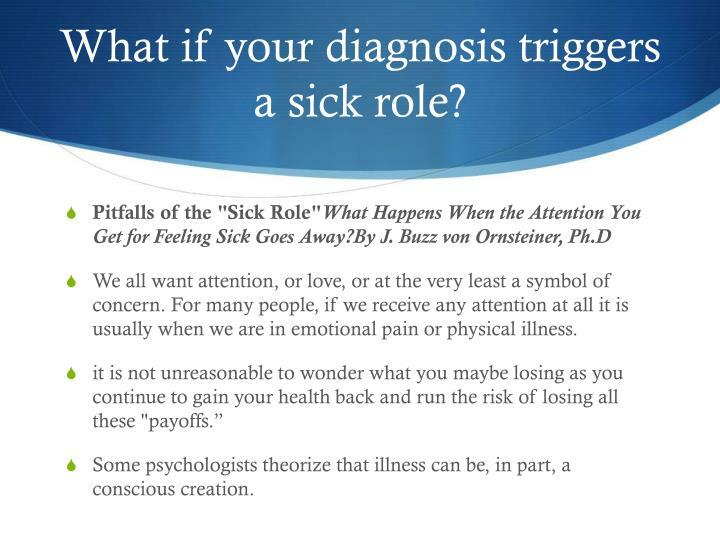 It seems many of the so-called psychosocial model advocates have ignored the rise of chronic illnesses and the pathologisation of everyday behaviours in health promotion. Parson’s sick role came to be seen as a negative referent (Shilling, 2002: 625) rather than as a useful interpretative tool. Parsons’ starting point is his understanding of illness as deviance. Illness is the breakdown of the general “capacity for the effective performance of valued tasks” (Parsons, 1964: 262). Losing this capacity disrupts “loyalty” to particular social commitments in specific contexts such as the workplace. Theories of the social construction of disability also provide an example of the cultural meaning of certain health conditions. The roots of this anti-essentialist approach are found in Stigma by sociologist Erving Goffman (1963), in which he highlights the social meaning physical impairment comes to acquire via social interactions. The social model of disability tends to conceptually distinguish impairment (the attribute) from disability (the social experience and meaning of impairment). Disability cannot be reduced to a mere biological problem located in an individual’s body (Barnes, Mercer, and Shakespeare, 1999). Rather than a “personal tragedy” that should be fixed to conform to medically determined standards of “normality” (Zola, 1982), disability becomes politicised. The issues we then need to confront are about the obstacles that may limit the opportunities for individuals with impairments, and about how those social barriers may be removed. In contrast, Parsons invokes a social contract (an idea which Cameron ran with when he described the “big society” with increased citizen responsibility) in which society’s “gift of life” is repaid by continued contributions and conformity to (apparently unchanging, non-progressive) social expectations. For Parsons, this is more than just a matter of symbolic interaction, it has far more concrete, material implications: “honour” (deserving) and “shame” (undeserving) which accompany conformity and deviance, have consequences for the allocation of resources, for notions of citizenship, civil rights and social status. Parsons, like the contemporary Conservatives, never managed to accommodate and reflect social change, suffering and distress, poverty, deprivation and conflict in his functionalist perspective. His view of citizens as oversocialised and subjugated in normative conformity was an essentially Conservative one. Furthermore, his systems theory was heavily positivistic, anti-voluntaristic and profoundly dehumanising. His mechanistic and unilinear evolutionary theory reads like an instruction manual for the neoliberal state. Parsons thought that social practices should be seen in terms of their function in maintaining order and social structure. You can see why his core ideas would appeal to Conservative neoliberals and rogue multinational companies. Conservatives have always been very attached to tautological explanations (insofar that they tend to present circular arguments. This “mind over matter” dogma is not benign; there are billions of pounds and dollars at stake for the global insurance industry, which is set to profit massively to the detriment of sick and disabled people. And billions to be saved and redistributed to big business and to fund tax cuts for the wealthy from our increasingly rationed and rapidly disappearing social security and NHS. The eulogised psychosocial approach is evident throughout the highly publicised UK PACE Trial on treatment regimes that entail Cognitive Behaviour Therapy (CBT) and graded exercise. By curious coincidence, that trial was also significantly about de-medicalising illnesses. Another curious coincidence is that Mansel Aylward – who co-authored the document I cited earlier – sat on the PACE Trial steering group. From 1996 to April 2005 Aylward was Chief Medical Adviser, Medical Director and Chief Scientist of the UK Department for Work and Pensions and Chief Medical Adviser and Head of Profession at the Veteran’s Agency, Ministry of Defence. He was on the board of the Benefits Agency Medical Service in the 1990s. Aylward has been heaviliy criticized for providing unwarranted academic credibility to the biopsychosocial model (with a heavy emphasis on the “psychological” element) which became both the basis and justification for the Conservative government’s disability support cuts. The government seem to have convinced themselves that for the poorest citizens, illness is all in the mind. Disability that entails additional needs and costs is really all about people simply conforming to roles, normative expectations, and academically constructed stereotypes. “Benefits can often make patients worse.” Ensuring that people can meet their basic survival needs is apparently a bad thing. Have you ever heard such utter nonsense? It’s much more likely that patients who become more severely ill require welfare support. Despite there being no empirical evidence whatsoever for Wessely’s claims, the Minister for Social Security was looking to cut spending, so self-styled “experts” like Wessely and Aylward were more useful to an expedient government than rigorous research, empirical evidence and common decency. I think it would be true to say that without social security, many people who are disabled because of Chronic Fatigue Syndrome (CFS) and other chronic illnesses that cause disability would experience MUCH worse symptoms, and many would undoubtedly die without lifeline support to enable them to meet the cost of their basic survival needs. And actually, that is precisely what is happening in the 6th wealthiest, so-called democratic nation in the world. My work is unfunded and I don’t make any money from it. But you can support Politics and Insights if you wish by making a donation which will help me continue to research and write informative, insightful and independent articles, and to provide support to others.